Home → Blog → I woke up with plantar fasciitis… or did I? I woke up with plantar fasciitis… or did I? It happened this morning. 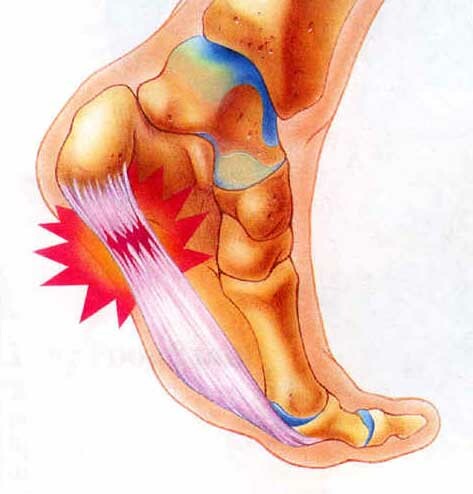 I woke up, took one step out of bed, and felt the searing pain in my heel that’s a sure sign of plantar fasciitis. Clearly, all this barefoot running isn’t good for me and caused this horrible injury. In fact, I’ve had a cold and barely been out of bed for the last 5 days. And for the last two weeks I haven’t done any running, thanks to frigid cold weather (remember, I’m a sprinter, so we don’t do cold) and being at a trade show (which went VERY well, thank you for asking). Simple. For some reason that I’ll never know, last night while I was sleeping my calf tightened up just enough to pull on my heel and give me symptoms that mimic plantar fasciitis. Once I got up and took a couple of steps, my calf loosened up and all the pain instantly disappeared, and I couldn’t recreate it in any way. I don’t have, and haven’t had, plantar fasciitis. But I often talk to people who have the same symptoms I’ve reported and THINK they have P.F. when, in reality, they have tight calves. Now, I’m not suggesting you don’t see a doctor, or that if you have PF symptoms you don’t have PF. But if you have pain that you think may be plantar fasciitis, before you reach for an orthotic or some motion controlled shoe, or worse (surgery! ), try foam rolling your calves… or get a massage, or soak in a hot bath with some epsom salts, or do a bit of trigger point work (find a spot that’s tight and apply pressure until it “gives”). See what happens if you loosen up the calves and let me know what you discover. ← Football leads to concussions. Does running lead to “foot concussions”?